Oct. 24, 1929 “Black Thursday” is memorable for it signalled the start of the Great Depression, an economic crisis that hurt many people. 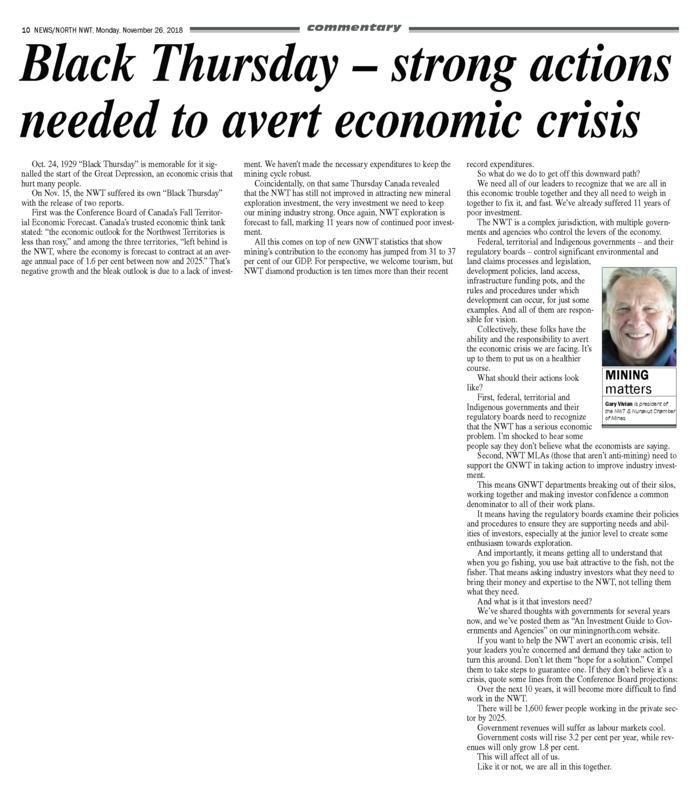 On Nov. 15, the NWT suffered its own “Black Thursday” with the release of two reports. First was the Conference Board of Canada’s Fall Territorial Economic Forecast. Canada’s trusted economic think tank stated: “the economic outlook for the Northwest Territories is less than rosy,” and among the three territories, “left behind is the NWT, where the economy is forecast to contract at an average annual pace of 1.6 per cent between now and 2025.” That’s negative growth and the bleak outlook is due to a lack of investment. We haven’t made the necessary expenditures to keep the mining cycle robust. Coincidentally, on that same Thursday Canada revealed that the NWT has still not improved in attracting new mineral exploration investment, the very investment we need to keep our mining industry strong. Once again, NWT exploration is forecast to fall, marking 11 years now of continued poor investment. All this comes on top of new GNWT statistics that show mining’s contribution to the economy has jumped from 31 to 37 per cent of our GDP. For perspective, we welcome tourism, but NWT diamond production is 10 times more than their recent record expenditures. So what do we do to get off this downward path? We need all of our leaders to recognize that we are all in this economic trouble together and they all need to weigh in together to fix it, and fast. We’ve already suffered 11 years of poor investment. The NWT is a complex jurisdiction, with multiple governments and agencies who control the levers of the economy. Federal, territorial and Indigenous governments – and their regulatory boards – control significant environmental and land claims processes and legislation, development policies, land access, infrastructure funding pots, and the rules and procedures under which development can occur, for just some examples. And all of them are responsible for vision. Collectively, these folks have the ability and the responsibility to avert the economic crisis we are facing. It’s up to them to put us on a healthier course. What should their actions look like? First, federal, territorial and Indigenous governments and their regulatory boards need to recognize that the NWT has a serious economic problem. I’m shocked to hear some people say they don’t believe what the economists are saying. Second, NWT MLAs (those that aren’t anti-mining) need to support the GNWT in taking action to improve industry investment. This means GNWT departments breaking out of their silos, working together and making investor confidence a common denominator to all of their work plans. It means having the regulatory boards examine their policies and procedures to ensure they are supporting needs and abilities of investors, especially at the junior level to create some enthusiasm towards exploration. And importantly, it means getting all to understand that when you go fishing, you use bait attractive to the fish, not the fisher. That means asking industry investors what they need to bring their money and expertise to the NWT, not telling them what they need. And what is it that investors need? We’ve shared thoughts with governments for several years now, and we’ve posted them as “An Investment Guide to Governments and Agencies” on our miningnorth.com website. Over the next 10 years, it will become more difficult to find work in the NWT. There will be 1,600 fewer people working in the private sector by 2025. Government revenues will suffer as labour markets cool. Government costs will rise 3.2 per cent per year, while revenues will only grow 1.8 per cent. This will affect all of us. Like it or not, we are all in this together.